Luisa had the good fortune to be born into one of those patriarchal families that still survive in our realm of Puglia and like to live deep in the country, peopling our farmhouses. .Her parents, Vito Nicola and Rosa Tarantino, had five children: Maria, Rachele, Filomena, Luisa and Angela. Maria, Rachele and Filomena married. Angela, commonly called Angelina, remained single and looked after her sister until she died. .Luisa was born on the Sunday after Easter and was baptized that same day. Her father – a few hours after her birth – wrapped her in a blanket and carried her to the parish church where holy Baptism was administered to her. .Nicola Piccarreta was a worker on a farm belonging to the Mastrorilli family, located at the middle of Via delle Murge in a neighborhood called Torre Disperata, 27 kilometers from Corato. Those who know these places, set among the sunny, bare and stony hills, can appreciate the solemnity of the silence that envelops them. Luisa spent many years of her childhood and adolescence on this farm. In front of the old house, the impressive, centuries-old mulberry tree still stands, with the great hollow in its trunk where Luisa used to hide when she was little in order to pray, far from prying eyes. It was in this lonely, sunny spot place that Luisa’s divine adventure began which was to lead her down the paths of suffering and holiness. Indeed, it was in this very place that she came to suffer unspeakably from the attacks of the devil who at times even tormented her physically. Luisa, to be rid of this suffering, turned ceaselessly to prayer, addressing in particular the Virgin Most Holy, who comforted her by her presence. Divine Providence led the little girl down paths so mysterious that she knew no joys other than God and his grace. One day, in fact, the Lord said to her: “I have gone round and round the world again and again, and I looked one by one at all my creatures to find the smallest one of all. Among so many I found you. Your littleness pleased me and I chose you; I entrusted you to my angels so that they would care for you, not to make you great, but to preserve your littleness, and now I want tobegin the great work of fulfilling my will. Nor will you feel any greater through this, indeed it is my will to make you even smaller, and you will continue to be the little daughter of the Divine Will” (cf. Volume XII, March 23, 1921). When she was nine, Luisa received Jesus in the Eucharist for the first time and Holy Confirmation, and from that moment learned to remain for hours praying before the Blessed Sacrament. When she was eleven she wanted to enroll in the Association of the Daughters of Mary – flourishing at the time – in the Church of San Giuseppe. At the age of eighteen, Luisa became a Dominican Tertiary taking the name of Sr. Maddalena. She was one of the first to enroll in the Third Order, which her parish priest was promoting. Luisa’s devotion to the Mother of God was to develop into a profound Marian spirituality, a prelude to what she would one day write about Our Lady. Jesus’ voice led Luisa to detachment from herself and from everyone. At about eighteen, from the balcony of her house in Via Nazario Sauro, she had a vision of Jesus suffering under the weight of the Cross, who raised his eyes to her saying: “O soul, help me!“. From that moment an insatiable longing to suffer for Jesus and for the salvation of souls was enkindled in Luisa. So began those physical sufferings which, in addition to her spiritual and moral sufferings, reached the point of heroism.The family mistook these phenomena for sickness and sought medical help. But all the doctors consulted were perplexed at such an unusual clinical case. Luisa was subject to a state of corpse-like rigidity – although she showed signs of life – and no treatment could relieve her of this unspeakable torment. When all the resources of science had been exhausted, her family turned to their last hope: priests. An Augustinian priest, Fr. Cosma Loiodice, at home because of the Siccardian* laws, was summoned to her bedside: to the wonder of all present, the sign of the Cross which this priest made over the poor body, sufficed to restore her normal faculties instantly to the sick girl. After Fr. Loiodice had left for his friary, certain secular priests were called in who restored Luisa to normality with the sign of the Cross. She was convinced that all priests were holy, but one day the Lord told her: “Not because they are all holy – indeed, if they only were! – but simply because they are the continuation of my priesthood in the world you must always submit to their priestly authority; never oppose them, whether they are good or bad” (cf. Volume I). Throughout her life, Luisa was to be submissive to priestly authority. This was to be one of the greatest sources of her suffering. Her daily need for the priestly authority in order to return to her usual tasks was her deepest mortification. In the beginning, she suffered the most humiliating misunderstandings on the part of the priests themselves who considered her a lunatic filled with exalted ideas, who simply wanted to attract attention. Once they left her in that state for more than twenty days. Luisa, having accepted the role of victim, came to experience a most peculiar condition: every morning she found herself rigid, immobile, huddled up in bed, and no one was able to stretch her out, to raise her arms or move her head or legs. As we know, it required the presence of a priest who, by blessing her with the sign of the Cross, dispelled that corpse-like rigidity and enabled her to return to her usual tasks (lace-making). She was a unique case in that her confessors were never spiritual directors, a task that Our Lord wanted to keep for himself. Jesus made her hear his voice directly, training her, correcting her, reprimanding her if necessary and gradually leading her to the loftiest peaks of perfection. Luisa was wisely instructed and prepared during many years to receive the gift of the Divine Will. The archbishop at that time, Giuseppe Bianchi Dottula (December 22, 1848-September 22, 1892), came to know of what was happening in Corato; having heard the opinion of several priests, he wished to exercise his authority and assume responsibility for this case. After mature reflection he thought it right to delegate to Luisa a special confessor, Fr. Michele De Benedictis, a splendid figure of a priest, to whom she opened every nook and cranny of her soul. Fr. Michele, a prudent priest with holy ways, imposed limits on her suffering and instructed her to do nothing without his permission. Indeed, it was Fr. Michele who ordered her to eat at least once a day, even if she immediately threw up everything she had swallowed. Luisa was to live on the Divine Will alone. It was under this priest that she received permission to stay in bed all the time as a victim of expiation. This was in 1888. Luisa remained nailed to her bed of pain, sitting there for another 59 years, until her death. It should be noted that until that time, although she had accepted her state as a victim, she had only occasionally stayed in bed, since obedience had never permitted her to stay in bed all the time even if she immediately threw up everything she had swallowed. Luisa was to live on the Divine Will alone. It was under this priest that she received permission to stay in bed all the time as a victim of expiation. This was in 1888. Luisa remained nailed to her bed of pain, sitting there for another 59 years, until her death. It should be noted that until that time, although she had accepted her state as a victim, she had only occasionally stayed in bed, since obedience had never permitted her to stay in bed all the time. However, from New Year 1889 she was to remain there permanently. In 1898 the new prelate, Archbishop Tommaso de Stefano (March 24, 1898 – 13 May 1906) delegated as her new confessor Fr. Gennaro Di Gennaro, who carried out this task for twenty-four years. The new confessor, glimpsing the marvels that the Lord was working in this soul, categorically ordered Luisa to put down in writing all that God’s grace was working within her. None of the excuses made by the Servant of God to avoid obeying her confessor in this were to any avail. Not even her scant literary education could excuse her from obedience to her confessor. Fr. Gennaro Di Gennaro remained cold and implacable, although he knew that the poor woman had only been to elementary school. Thus on February 28, 1899, she began to write her diary, of which there are thirty-six large volumes! The last chapter was written on December 28, 1939, the day on which she was ordered to stop writing. Her confessor, who died on September 10,1922, was succeeded by the canon, Fr. Francesco De Benedictis, who only assisted her for four years, because he died on January 30, 1926. Archbishop Giuseppe Leo (January 17, 1920-January 20,1939) delegated a young priest, Fr. Benedetto Calvi, as her ordinary confessor. He stayed with Luisa until she died, sharing all those sufferings and misunderstandings that beset the Servant of God in the last years of her life. At the beginning of the century, our people were lucky enough to have Saint Annibale Maria Di Francia present in Puglia. He wanted to open in Trani male and female branches of his newly founded congregation. When he heard about Luisa Piccarreta, he paid her a visit and from that time these two souls were inseparably linked by their common aims. 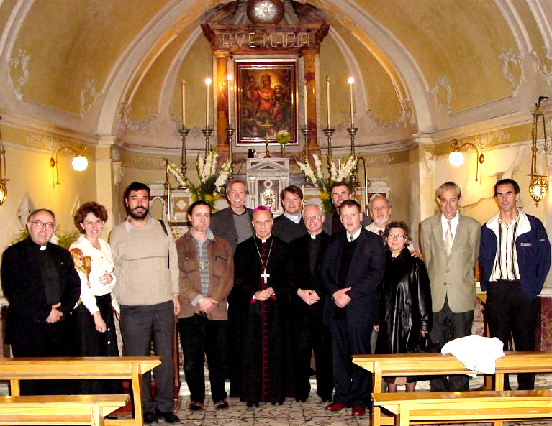 Other famous priests also visited Luisa, such as, for example, Fr. Gennaro Braccali, the Jesuit, Fr. Eustachio Montemurro, who died in the odor of sanctity, and Fr. Ferdinando Cento, Apostolic Nuncio and Cardinal of Holy Mother Church. Saint Annibale became her extraordinary confessor and edited her writings, which were little by little properly examined and approved by the ecclesiastical authorities. In about 1926, Saint Annibale ordered Luisa to write a book of memoirs of her childhood and adolescence. He published various writings of Luisa’s, including the book L’orologio della Passione, which acquired widespread fame and was reprinted four times. On October 7,1928, when the house of the sisters of the Congregation of Divine Zeal in Corato was ready, Luisa was taken to the convent in accordance with the wishes of Saint Annibale. Saint Annibale had already died in the odor of sanctity in Messina.In 1938, a tremendous storm was unleashed upon Luisa Piccarreta: she was publicly disowned by Rome and her books were put on the Index. At the publication of the condemnation by the Holy Office, she immediately submitted to the authority of the Church. A priest was sent from Rome by the ecclesiastical authorities, who asked her for all her manuscripts, which Luisa handed over promptly and without a fuss. Thus all her writings were hidden away in the secrecy of the Holy Office. On October 7, 1938, because of orders from above, Luisa was obliged to leave the convent and find a new place to live. She spent the last nine years of her life in a house in Via Maddalena, a place which the elderly of Corato know well and from where, on March 8, 1947, they saw her body carried out. Luisa’s life was very modest; she possessed little or nothing. She lived in a rented house, cared for lovingly by her sister Angela and a few devout women. The little she had was not even enough to pay the rent. To support herself she worked diligently at making lace, earning from this the pittance she needed to keep her sister, since she herself needed neither clothes nor shoes. Her sustenance consisted of a few grams of food, which were prepared for her by her assistant, Rosaria Bucci. Luisa ordered nothing, desired nothing, and instantly vomited the food she swallowed. She did not look like a person near death’s door, but nor did she appear perfectly healthy. Yet she was never idle, she spent her energy either in her daily suffering or her work, and her life, for those who knew her well, was considered a continuous miracle. Her detachment from any payments that did not come from her daily work was marvelous! She firmly refused money and the various presents offered to her on any pretext. She never accepted money for the publication of her books. Thus one day she told Saint Annibale that she wanted to give him the money from her author’s royalties: “I have no right to it, because what is written there is not mine” (cf. Preface of the L’orologio della Passione, Messina, 1926). She scornfully refused and returned the money that pious people sometimes sent her.Luisa’s house was like a monastery, not to be entered by any curious person. She was always surrounded by a few women who lived according to her own spirituality, and by several girls who came to her house to learn lace-making. Many religious vocations emerged from this “upper room”. However, her work of formation was not limited to girls alone, many young men were also sent by her to various religious institutes and to the priesthood. Her day began at about 5.00 a.m., when the priest came to the house to bless it and to celebrate Holy Mass. Either her confessor officiated, or some delegate of his: a privileged granted by Leo XIII and confirmed by St. Pius X in 1907. After Holy Mass, Luisa would remain in prayer and thanksgiving for about two hours. At about 8.00 a.m. she would begin her work which she continued until midday; after her frugal lunch she would stay alone in her room in meditation. In the afternoon – after several hours of work – she would recite the holy Rosary. In the evening, towards 8.00 p.m., Luisa would begin to write her diary; at about midnight she would fall asleep. In the morning she would be found immobile, rigid, huddled up on her bed, her head turned to the right, and the intervention of priestly authority would be necessary to recall her to her daily tasks and allow her to sit up in bed. Luisa died at the age of eighty-one years, ten months and nine days, on March 4, 1947, after a fortnight of illness, the only one diagnosed in her life, a bad attack of pneumonia. She died at the end of the night, at the same hour when every day the priest’s blessing had freed her from her state of rigidity. Archbishop Francesco Petronelli (May 25, 1939-June 16, 1947) archbishop at the time. Luisa remained sitting up in bed. It was impossible to lay her out and – an extraordinary phenomenon – her body never suffered rigor mortis and remained in the position in which it had always been. Hardly had the news of Luisa’s death spread, like a river in full spate, all the people streamed into her house and police intervention was necessary to control the crowds that flocked there day and night to visit Luisa, a woman very dear to them. A voice rang out: “Luisa the Saint has died“. To contain all the people who were going to see her, with the permission of the civil authorities and health officials, her body was exposed for four days with no sign of corruption. Luisa did not seem dead, she was sitting up in bed, dressed in white; it was as though she were asleep, because as has already been said, her body did not suffer rigor mortis. Indeed, without any effort her head could be moved in all directions, her arms raised, her hands and all her fingers bent. It was even possible to lift her eyelids and see her shining eyes that had not grown dim. Everyone believed that she was still alive, immersed in a deep sleep. A council of doctors, summoned for this purpose, declared, after attentively examining the corpse, that Luisa was truly dead and that her death should be accepted as real and not merely apparent, as everyone had imagined.Luisa had said that she was born “upside down”, and that therefore it was right that her death should be “upside down” in comparison with that of other creatures. She remained in a sitting position as she had always lived, and had to be carried to the cemetery in this position, in a coffin specially made for her with a glass front and sides, so that she could be seen by everyone, like a queen upon her throne, dressed in white with the Fiat on her breast. More than forty priests, the chapter and the local clergy took part in the funeral procession; the sisters took turns to carry her on their shoulders, and an immense crowd of citizens surrounded her: the streets were incredibly full; even the balconies and rooftops of the houses were swarming with people, so that the procession wound slowly onwards with great difficulty. The funeral rite of the little daughter of the Divine Will was celebrated in the main church by the entire chapter. All the people of Corato followed the body to the cemetery. Everyone tried to take home a keepsake or a flower, after having touched her body with it; a few years later, her remains were translated to the parish of Santa Maria Greca. In 1994, on the day of the Feast of Christ the King, in the main church, Archbishop Carmelo Cassati, in the presence of a large crowd including foreign representatives, officially opened the beatification cause of the Servant of God Luisa Piccarreta.